The Flipstick is a well-designed and practical portable charger that measures 1 x 1.25 x 5.25 inches. As we can see from the images, the power bank sports an ultra compact stick-style form factor that enables it to become an ideal partner for your smartphone, and the loop formed by its integrated USB cable even allows it to work with a carabiner for easy carrying during an outdoor activity. Meanwhile, the matte finish provides improved elegance and a comfortable grip. The Flipstick comes equipped with a 3350mAh rechargeable battery. Using an integrated microUSB or Lightning cable with 1A output, you can use the power bank to charge your iPhone or Android phone without having to carry an extra charging cable. Moreover, a 4-LED indicator displays the battery level of your Flipstick, and an integrated USB cable recharges itself with ease. 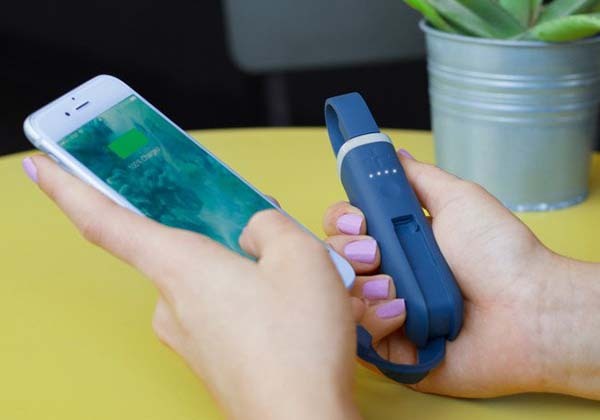 The Flipstick portable power bank is priced at $29.99 USD ($39.99 for the model with Lightning cable). If you’re interested, jump to TYLT Amazon shop for its more details. BTW, don’t miss the power bank with Apple Watch charger and more related gadgets by following tags.